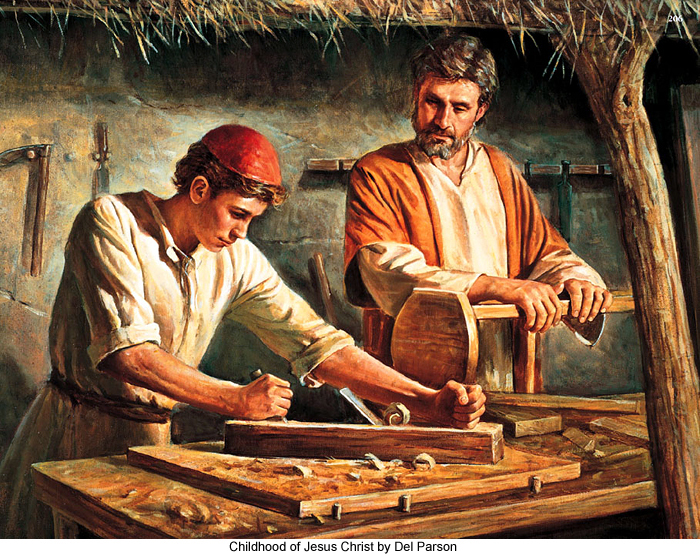 156:5.2 It was during this same sermon that Jesus made use of his first and only parable having to do with his own trade—carpentry. In the course of his admonition to "Build well the foundations for the growth of a noble character of spiritual endowments," he said: "In order to yield the fruits of the spirit, you must be born of the spirit. You must be taught by the spirit and be led by the spirit if you would live the spirit-filled life among your fellows. But do not make the mistake of the foolish carpenter who wastes valuable time squaring, measuring, and smoothing his worm-eaten and inwardly rotting timber and then, when he has thus bestowed all of his labor upon the unsound beam, must reject it as unfit to enter into the foundations of the building which he would construct to withstand the assaults of time and storm. Let every man make sure that the intellectual and moral foundations of character are such as will adequately support the superstructure of the enlarging and ennobling spiritual nature, which is thus to transform the mortal mind and then, in association with that re-created mind, is to achieve the evolvement of the soul of immortal destiny. Your spirit nature—the jointly created soul—is a living growth, but the mind and morals of the individual are the soil from which these higher manifestations of human development and divine destiny must spring. The soil of the evolving soul is human and material, but the destiny of this combined creature of mind and spirit is spiritual and divine."